Pictures: Liz (sans cello) and I onstage after the concert. Liz and I outside the Philharmonie. 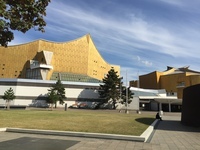 Philharmonie exterior. I had never been to Europe. I had also never expected that my first visit would be three weeks performing in some of the most prestigious concert halls in the world. I may not have seen much outside of concert halls while I was there, but I can’t imagine a better first visit to Europe. To tell you the truth, the Philharmonie was not nearly as beautiful as I expected it to be. The exterior, which looks magical in pictures, was in person a rather odd-looking building, and clearly aging. I walked all the way around it, hoping to find the magical angle that I’ve see in all the pictures. Nope. Just an odd-looking, aging bit of modern architecture. The interior was equally unimpressive. A lot of concrete, a lot of drab-looking colors, nothing particularly interesting or captivating. But the sound? Now there’s the reason it’s a world-class concert hall! When the Philharmonie was designed in the 60s, the notion of audience surrounding the performers was a huge departure from tradition. But the way the audience seats are configured, broken up by flat, hard surfaces, did some sort of acoustical magic that has given this hall a legendary sound quality. The other advantage to having the audience surround the stage is that the audience and performers feel closer together. It did not at all feel like there were 2,400 people in the audience; being able to see people’s faces so close to us, and knowing that there were people sitting behind us listening, made the whole performing experience seem so much more personable. More than anything, it was rewarding to realize that people were touched by the concert. I had been looking forward to going to Europe, but hadn’t really realized that there were people there waiting for us to come. Discovering that made this concert special.